The Top Choice of Hotels in Columbus, Ohio Conveniently located near Port Columbus International Airport, the Crowne Plaza Downtown Columbus hotel and Lofts offers upscale amenities, exciting features and easy access to the most popular local attractions! While staying with us, you are just steps away from the Short North Arts District, German Village, and Brewery District. If youre looking for hotels near Ohio State University, we are the perfect choice for any collegiate occasion, including Buckeyes games, college visits and graduations. As the best of hotels near Nationwide Arena, we offer a prime location for guests to experience all of the action. Catch a Columbus Blue Jackets hockey game, see concerts from all of your favorite artists, and much more! The Crowne Plaza hotel in Columbus, OH is also the perfect place for business travelers. 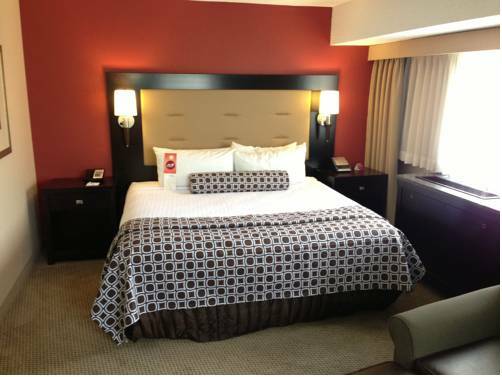 Of the hotels near Columbus Convention Center, we are certainly the most convenient. We are directly connected to the facility and just a short walk to Nationwide Mutual Insurance, The Ohio Statehouse, AEP, NiSource, Columbia Gas and a number of other local companies. With 13,000 sq. ft. of flexible space, a creative menu, and a dedicated Crowne Meetings Director, we are committed to the success of your next event. Max and Erma's On the Boulevard: Max and Erma's offers a delicious variety of house specialties along with everyone's favorite hometown burgers. The atmosphere is for small to large parties. Max and Erma's offers a full service bar and outdoor patio. Hyde Park Prime Steakhouse: Hyde Park Prime Steakhouse specializes in fine, aged steaks and chops, lobster and fresh fish since 1988. Bucca di Beppo: Like Little Italy in the 50's, Buca di Beppo celebrates the hearty cooking of southern Italian immigrants. A place where meats and pastas overflow from their plates right on to the table, wine flows from the jug, and laughter often drowns out the music. Gordon Biersch: Gordon Biersch's original dishes feature multi ethnic favorites from America, Asia, Europe, the Mediterranean and Latin America, with intense flavors and fresh local ingredients. German lagers brewed on premise. Riviera Meeting Room: This room features oversized windows overlooking Nationwide Boulevard that allow in just the right amount of natural light for your daytime meeting and a peek at the excitement of the Arena District at night. 792 square feet. Kingsmill Meeting Room: This room features oversized windows overlooking Nationwide Boulevard that allow in just the right amount of natural light for your daytime meeting and a peek at the excitement of the Arena District at night. 926 square feet. Scioto Meeting Room: This room features oversized windows overlooking Nationwide Boulevard that allow in just the right amount of natural light for your daytime meeting and a peek at the excitement of the Arena District at night. 792 square feet. Hickory Boardroom: Oversized executive leather chairs, a conference table for 10, wet bar and two walls of windows make our Hickory Boardroom the perfect place for any small meeting. Heritage Meeting Room: Beautiful natural light flows readily through the high windows in this unique meeting room that features a small kitchenette and private in-room restroom. The Heritage Room is recommended for small meetings and as a hospitality room during your event. Fusion: Weddings, dinners, cocktail receptions and more... the Fusion Room provides exciting and unique space. Featuring an in-room private bar, spectacular tile entry, frosted glass entry doors, and over 50' of windows, this room is both flexible and beautiful. Muirfield Ballroom: The Muirfield Ballroom provides the most flexible of all meeting space. Its grand beauty makes a perfect backdrop for everything from weddings to meetings. This room may be partitioned into 1, 2 or 3 separate rooms, each section is 988 square feet. Airport Golf CourseOpened in 1966, this Jack Kidwell-designed championship course bordering Big Walnut Creek offers mature tree-lined fairways, strategically placed water hazards and a unique parade of aircraft courtesy of the Port Columbus International Airport. Raymond Memorial Golf CourseRaymond Memorial carries a 4.5 star rating from Golf Digest and a pedigree, as it the course was designed by Robert Trent Jones Sr. Champions Golf CourseAnother one of Robert Trent Jones designs, Champions, is rated as a championship course by Business First Magazine.